Satisfy your sweet tooth with these flavor-packed, protein-stacked, macro-friendly macaroons! Imagine crossing fresh coconut with a soft vanilla cookie and meringue. Got the sweet goodness in your head? Good! 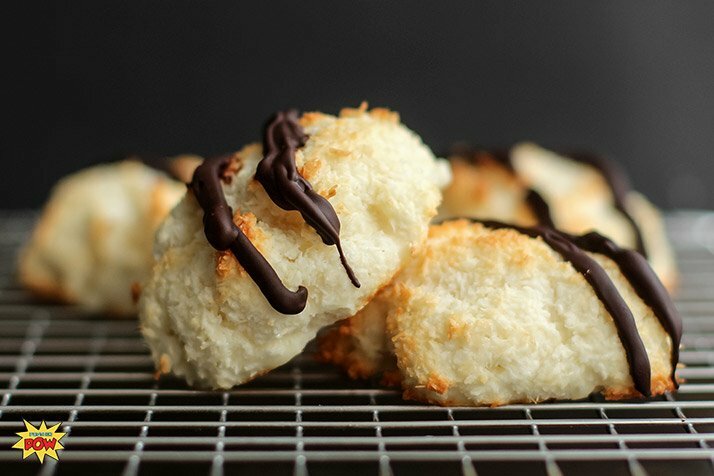 That's exactly what these coconut macaroons—not to be confused with French macarons—are like. In case you've never had macaroons, they're a smooth explosion of coconut-flavored, cakey greatness. In short, they're a dessert-lover's dream. And now, because I've found a way to make them healthy, they can be yours, too! With just a bit of crunch and a touch of chocolate, these protein macaroons are absolutely sublime. Enjoy them alongside a tall Americano for a delightful midafternoon or after-dinner snack. Another plus is that these are easily customizable. Some people actually coat the bottom of their macaroons in chocolate. While you can do that—after all, who doesn't love chocolate?—I personally prefer a more delicate approach: I like to add a mere hint of chocolate on top of my cakelike base. Try both options and see what you like best! The Ultimate Protein Powder Cookbook! Power up your protein with Anna Sward's collection of delicious recipes! Go Now!